Rhabdomyosarcoma of the prostate is usually seen in children. Rare cases have been reported in adults. Most cases present at advanced stages and are unresectable. The case shown here is from an 11 month old male who presented with urinary obstruction and a large abdominal mass. 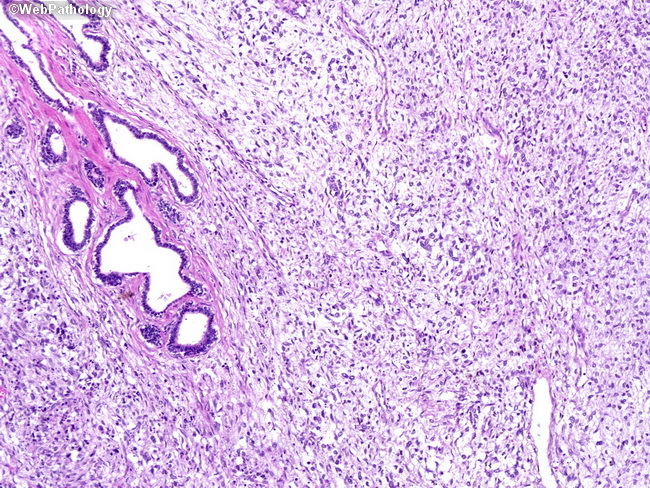 The tumor is composed of primitive spindle cells with scant cytoplasm in a myxoid stroma. A few preserved prostatic glands are seen.